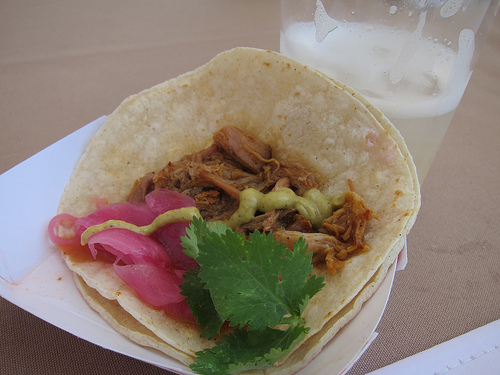 The second Summer Tasting of the LA Street Food Fest returned to the Rose Bowl this past Saturday. After producing two spectacular street food fests last year, organizers thoughtfully tweaked this year’s fest so everyone could enjoy. There were originally three sessions planned with an attendees cap but with the faux-Carmeggedon hype, the morning session was canceled. 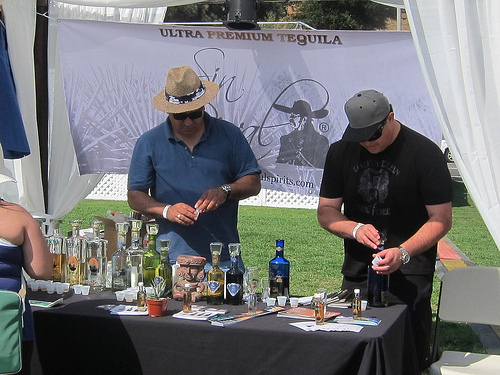 There were concerns vendors and attendees might not be able to make it to Pasadena in time. However, the day turned out to be fantastic with everyone able to zip in and out with minimum fuss. 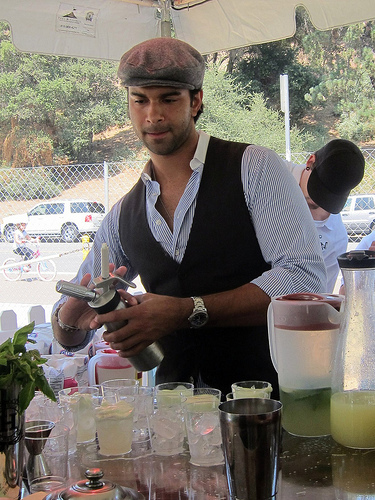 With free parking, nary a line and plenty of food and drinks, this was the festival to be at. I started the afternoon right with the Tiara Cafe’s “molten balls of lust” – a mac and cheese ball that contained short ribs and drizzled with “hot and sweaty” BBQ sauce. 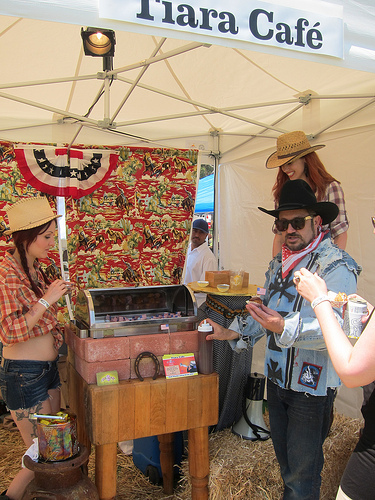 The cowgirls and cowboy chef sure did bring it to LASFF. 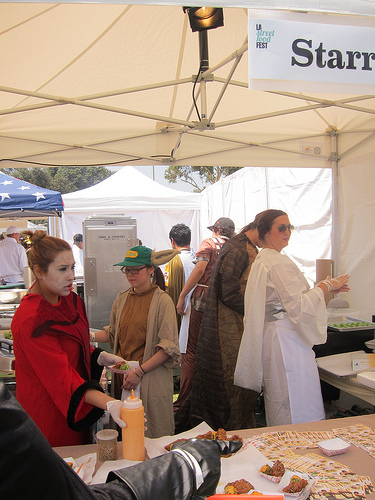 As always, Nguyen of Starry Kitchen rocked a costume but not only that, the entire SK team did as well. 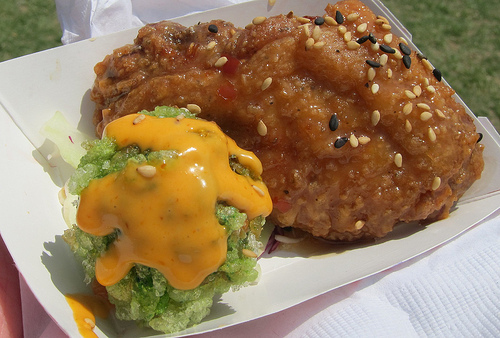 Star Wars presented tofu balls, pandan donut holes and chicken wings. I don’t know how I spaced eating the donut hole- oh that’s right, I wasn’t eating dessert. Then I ate a lot of tacos. Like, seriously a lot. 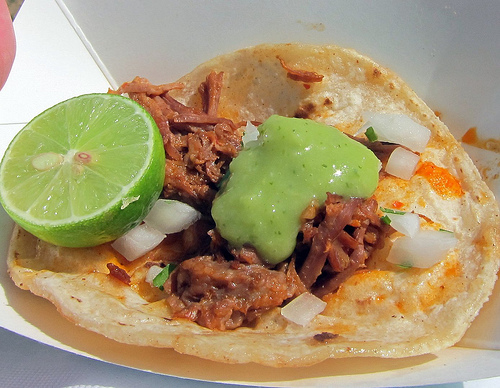 The venison chile verde from Cacao was a stand-out. If you like spicy, this is the one to get! 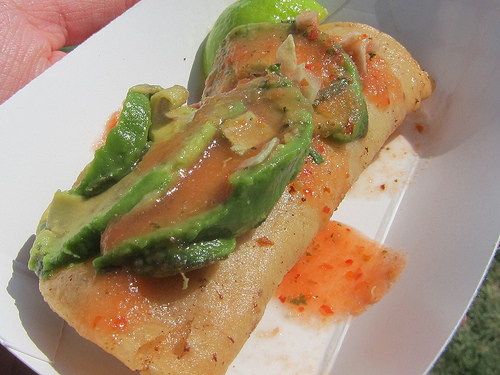 Loved the Taco de Dorado de Camarones from Mariscos de Jaliscos. 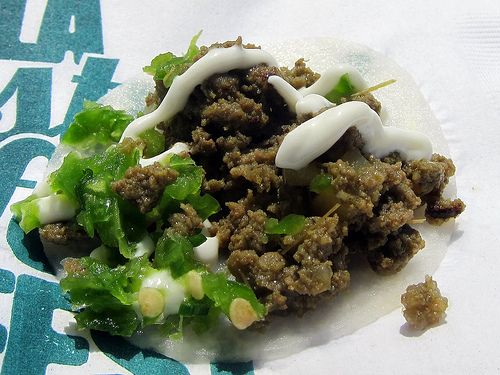 The hard-shell shrimp taco was a good counter-point to all the soft tacos I was greedily gulping down. 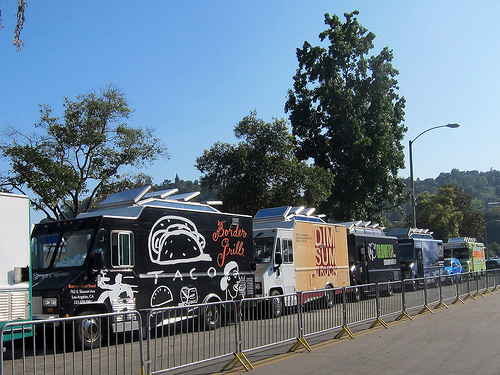 Of course it wouldn’t be a street food festival without food trucks. 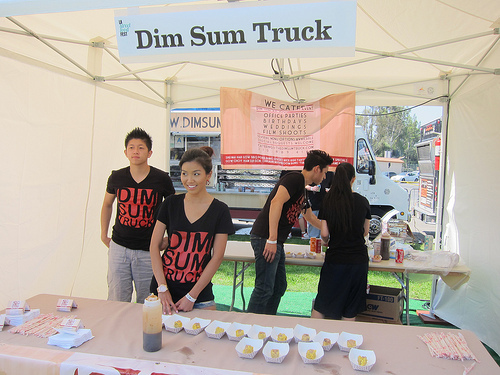 I probably should have tried some new trucks but I found myself at one of my faves, Dim Sum Truck, for their shu mai. 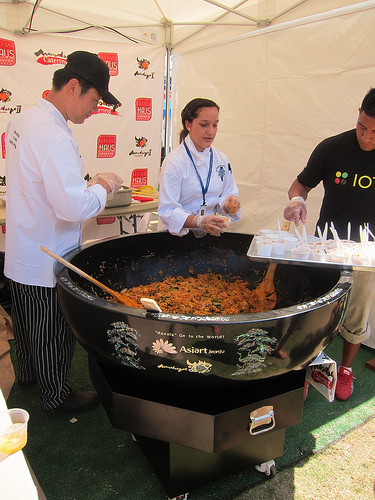 Over at the Moo Dae Po tent, they brought what seemed like the largest bibimbap bowl ever! They also own Iota, a new coffee house and bakery. 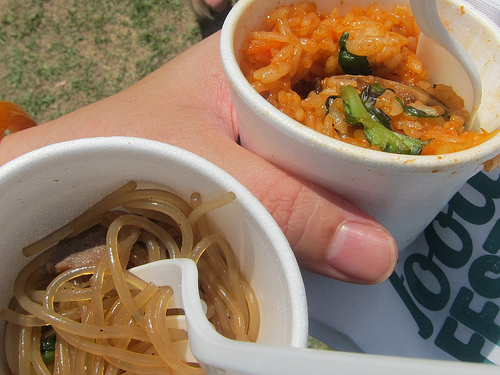 I had an iced coffee from them and got some japchae as well. Seethee Thai was listed as bringing chicken and rice but they said this was fried sole. They also brought their prosperous baby back ribs. 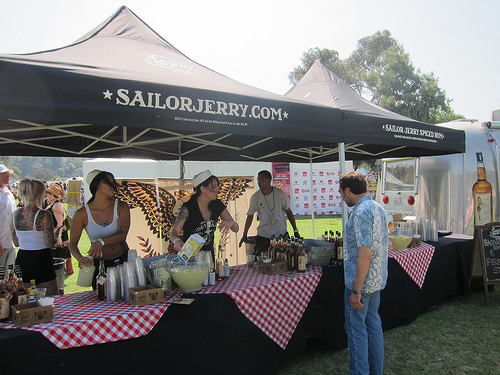 In addition to two Singha beer gardens, there was no shortage of booze at LASFF. With the tequila tasting tents, Julian Cox in the Test Kitchen Luxe Lounge mixing up Hendricks Gin cocktails and the lovely ladies of Sailor Jerry, we were quite happy with the tipples. 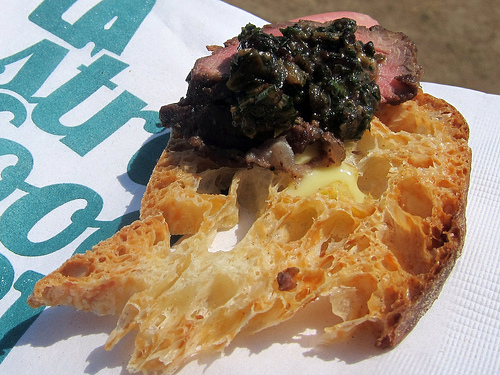 I loved that there were some serious chef star power at LASFF including Chef Christian Page of Tione’s Quality Meats serving up grilled peaches and lamb shoulder. 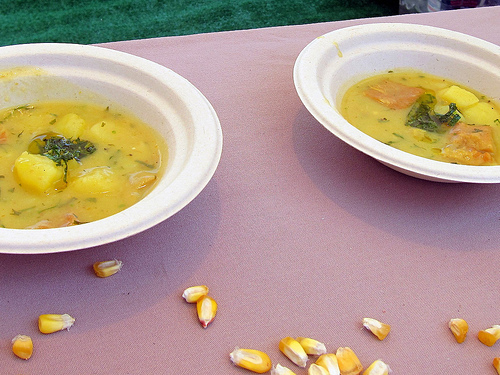 Chef Ricardo Zarate of Picca and Mo-Chica brought cau cau, a Peruvian tripe stew. 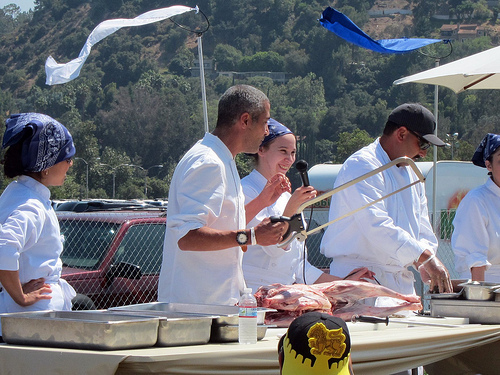 Chef Farid Zadi led a funny and informative lamb butchering demo. 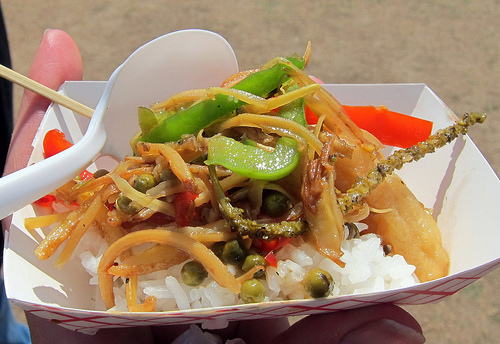 I loved that it was a diverse amount of street food. 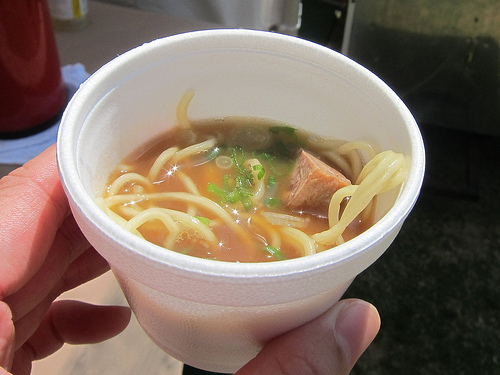 I enjoyed the ramen from Jinya so much, I ended up getting ramen later that night. 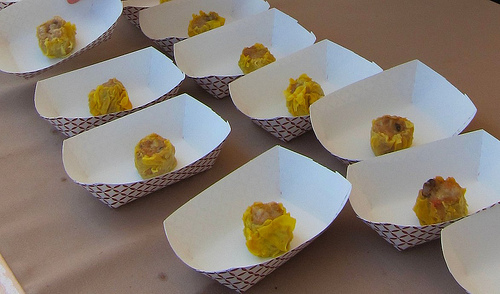 I also liked the meat-filled pastry from Taste of Tunisia. 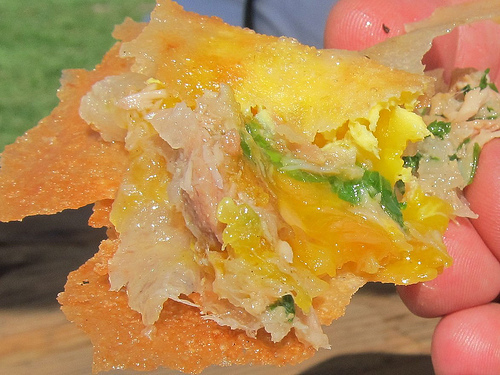 The Brik even had a bit of egg in it and we all know things are better with egg. Woah! 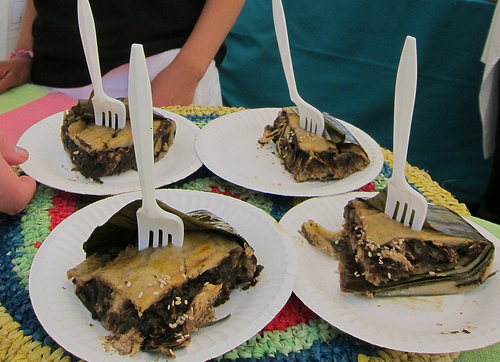 Guelaguetza went all out and brought these huge servings of mole tamales. I have always loved their mole. After this, I broke my no sweets rule and rushed over to the Ice Cream Social area where I got a wonderful (non-alcoholic) mojito shaved ice from Ice Ice Shavie. 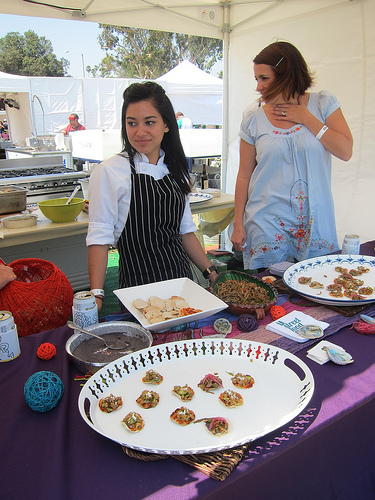 The thing that got me most excited about the LASFF this year were all the Baja chefs. 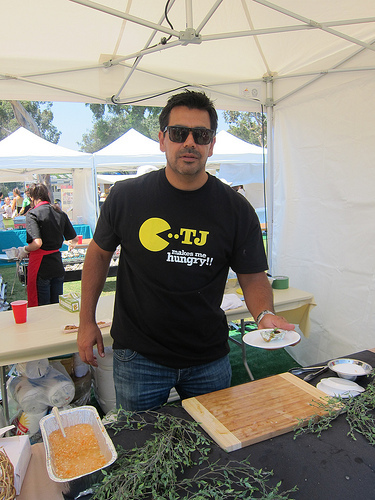 Chef Javier Plascencia’s food has registered in my subconscious as a must-try. I was delighted his restaurant, Mission 19, brought Pacific Ocean oyster asada. 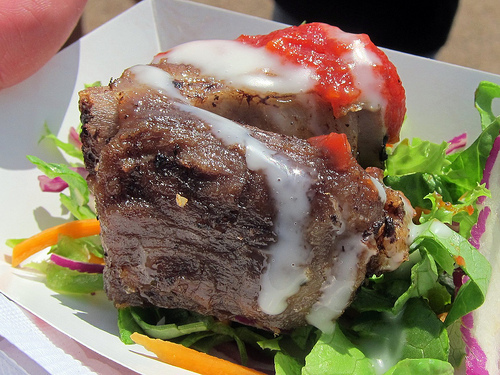 Topped with chicharron short rib, serrano ponzu butter and lemongrass foam, it’s no wonder this was a crowd favorite. 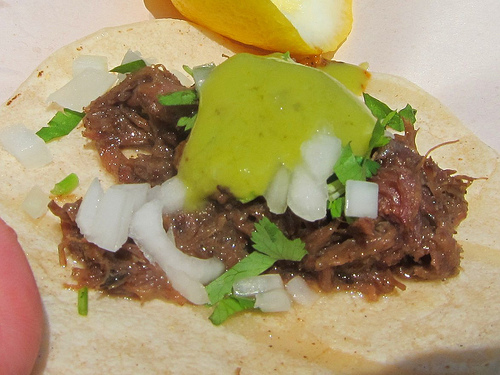 I also enjoyed the mini-beef cheek tacos from Casa Plascencia. 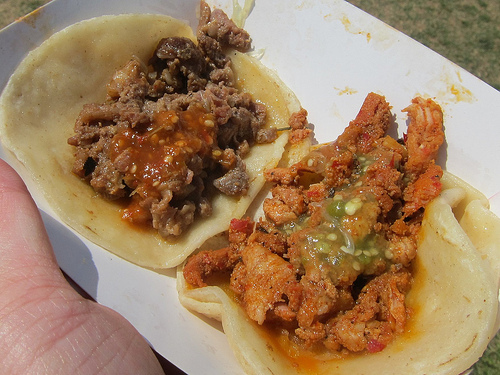 Manzanilla Restaurante brought a trio of different tacos. 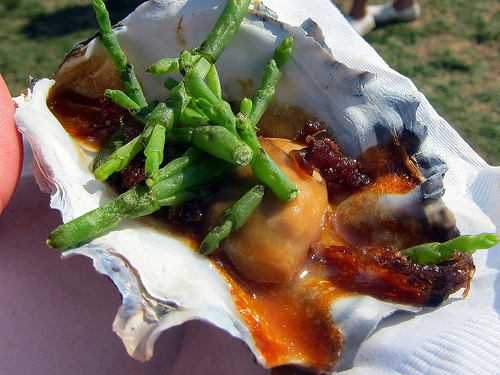 I tried the abalone and loved it. 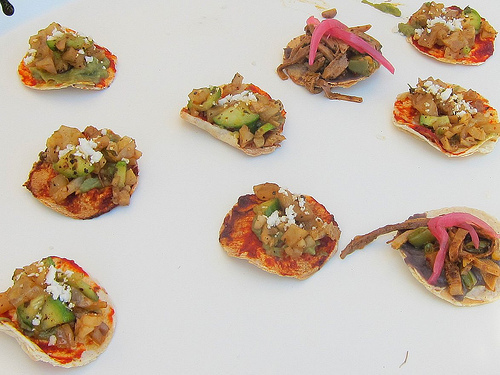 Besides Mission 19’s oysters, the buzz seemed to surround La Guerrerense’s sea urchin tostadas. These were fresh, just a hint of brine and very creamy. 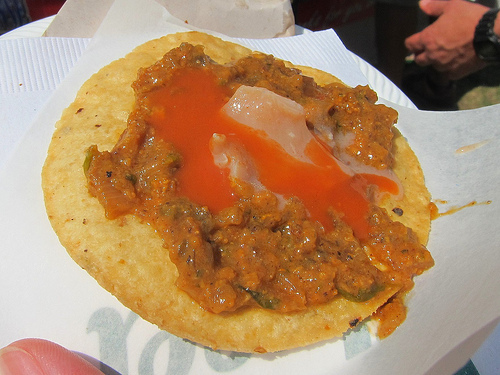 I loved how they pushed their spiciest salsas to top the tostada but I played it safe and picked a medium-spiced one. 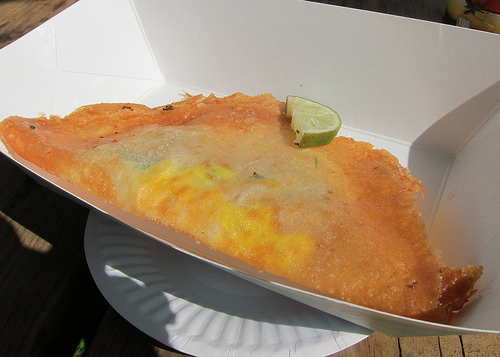 I couldn’t try every single food stand– I wish I could have! I’m going to have to plan my attack better for next year. 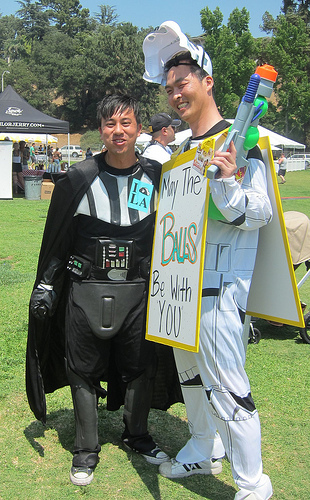 LASFF 2010 Recap- the very first!